cupcakeMAG for Littles: Fashionable Treats for Chic Moms & Their Babes: Etsy Featured Designer: Heather of Olive & Ollie plus a giveaway! Etsy Featured Designer: Heather of Olive & Ollie plus a giveaway! "inspired goods made by hand for your little one"
We still recall the day we came across olive & ollie on Etsy - it was a dream come true! Handmade, quality clothing & uber-cute finds for our littles. We immediately fell in love even more when Heather, the owner, sent us some fabulous goodies. The attention to detail and quality is beyond perfection. 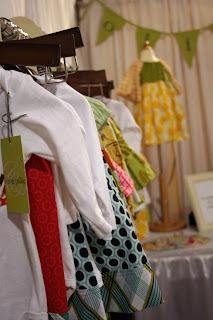 olive & ollie is definitely a shop you will began a love affair with -- beautiful clothes for stylish littles. Lucky for us we sat down with Heather to chat and get to know everything about her sweet little shop. Tell us about Olive & Ollie. What inspired the name? Olive and Ollie began very simply, and I never dreamt that it would turn into a real business. I started making bibs and appliquéd shirts for my son who was born in 2006, because I couldn’t find a lot of things on the market for him that I liked. Friends liked my work, and soon people started asking me to make things for them as well. Olive and Ollie is named after two women in my family, my great-grandmother Olive, and my great-great-aunt Ollie. Both were strong, independent women who made all sorts of things by hand, and shared my belief that handmade is best. In fact, I still have the baby quilt my aunt Ollie made for me over 30 years ago, when she was in her 70s. How long have you been sewing? What made you decide to start your adorable shop on Etsy? I’ve been sewing on and off since junior high, which was way too long ago to admit! Honestly, I guess about 20 years or so, which makes me sound really old, doesn’t it?! I signed up on etsy.com to open a shop in May 2007, but it wasn’t until April of the following year that I listed anything. By that time I now had a toddler and a newborn, and I knew I didn’t want to go back to my day job, so I went full steam ahead with my little endeavor. I would design and sew while my babies napped, but the vast majority of my work was done at night after they were in bed. And I’ve been working that way since then. It’s sometimes tough to work so many late nights, but it allows me to be home with my babies, and that is priceless and totally worth the lack of sleep. Has this become a full time job or do you still consider it a hobby as so many do when they sew? This has definitely become a full time job for me, and I’m really excited about the possible directions I could take this business in. I’m so lucky that I get to do what I love and make a living from it. Thank you so much! A handmade boutique would be great, and may happen some day when my kids are older. For now, I’m working on new designs and also trying my hand at some pattern making as well. I’m also introducing modern quilts for babies and toddlers in my shop, so keep an eye out for those as well! Heather, as kind as she is has given YOU a chance to win a $50 Gift Certificate to her shop! Read on to see just how you can get started collecting for your Olive & Ollie collection! 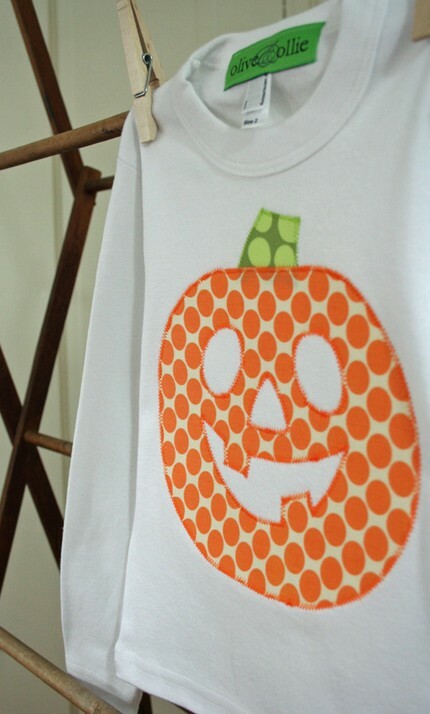 We adore this super cute unique tee for Halloween! Leave us a comment telling us just what you would LOVE to get. Make sure you are a follower of cupcakeMAG and Sprinkles. For extra entries do the following and leave us a separate comment telling us each you have done. 4. Subscribe to our updates (top right corner above) - just sign up with your email! 5. VOTE for us on Top Mommy Blogs here -- just select "click to vote" -- you don't have to register - just a simple click. 6. Tweet about this giveaway and include @cupcakemag -- you must tweet, not just follow. Also, make sure you tell us YOUR twitter name. 7. Tweet about this giveaway and include @oliveandollie-- you must tweet, not just follow. 8. Write a blog post about this giveaway on your blog and send us the link. The winner will be selected by random.org on Wed., October 6th after 11pm. Please make sure you live us your email in one of the comments as well! I would love to get my son a shirt and my daughter a skirt! Lovely things. following ollie and ollie on twitter now. Heather has the best things! If I could pick anything I'd pick two of the Jack o Lantern shirts because then my kids wouldn't fight over it and it's super cute! Love the rocket outfit too. I love Heather's lounge sets! I follow Olive & Ollie on twitter. I tweeted. : ) Thanks for the chance. Heather is one talented lady!! I follow the Olive & Ollie blog every day and I love the dresses! I signed up for you to sprinkle my inbox with goodies...lol!! voted for the top mommy blogs! I would love anything from Heather. Everything she makes is awesome! !It washes up great,looks great, and gets plenty of wonderful comments. i would love one of her peasant dresses and will for sure be ordering a birthday outfit when my daughter turns one. i also just voted for you on "top mommy blogs"
I'd really like the Custom Initial Shirts! Thanks! Found Olive and Ollie at the Creative Connection and LOVE these items. So much fun. There are many yummies I'd like for my daughter. I excited to be subcribing to your blog now. I would love to get the Orange Blossoms Oversized Blanket. I follow this blog. I follow CupcakeMAG on Twitter (kiddo47). I follow Olive and Ollie on Twitter (kiddo47). I am a "liker" on fb...cute stuff!! I follow with GFC and I would LOVE to get the Custom Birthday Lounge Set with Ruffle Pants or Capris and Appliqued Tee in Garden Party by Olive and Ollie. My little girl has a birthday on Halloween and would love to wear such a set on her special day. I LOVE the Custom Appliqued Rocket Lounge Set. I follow via GFC, thanks! I would get my daughter the Modern Peasant Dress in Paradise Garden. That is such a beautiful print! We really like the Custom Initial Shirts! Thanks for the giveaway! I'd love to get a custom outfit like the birthday outfit with the adorable skirt! follow olive and ollie on twitter! I liked CupcakeMag on FB! I'm following CUpcakeMag on Twitter. I'm following Olive and Ollie on twitter! I have subscribed to CupcakeMAGsprinkles updates! I voted on topmommyblogs site! Applique Shirt! Too cute for my neice! I love their things. thanks! I voted for you on Top Mommy Blog. Thanks! I'm a facebook fan. Thanks! i would get my princess a Custom Birthday Lounge Set with Ruffle Pants or Capris and Appliqued Tee. Love it! I'm following you and I love the Custom Girls Birthday Shirt with Number and Crown. 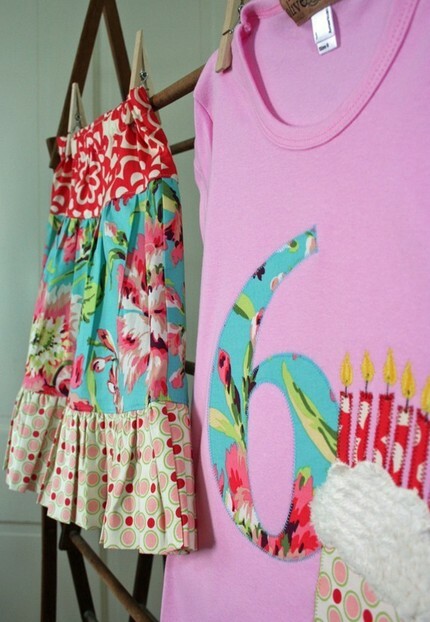 My favorite is the Custom Birthday Outfit with Twirl Skirt and Appliqued Tee in Amy Butler Love Aqua Bliss by Olive and Ollie! Thanks for the chance to win! I love the Modern Peasant Dress in Paradise Garden! My must haves: the tie tee and rocket lounger!! Congrats to tracypell75@yahoo.com -- YOU WON!